There is no end to the number of books one can find on the works or study of William Shakespeare. The name ‘Stanley Wells’ is certainly familiar to anyone who’s read critical essays on Shakespeare. This book, Shakespeare On Page and Stage, is a collection of some of Wells’ essays on the Bard, his work, and performances of his work. And mostly we’re left with: meh. Some of these essays were interesting and from some I learned a thing or two, but the bulk of them really didn’t add anything to my knowledge or appreciation of Shakespeare’s plays. The book collects essays in four basic themes: 1) Shakespearian Influences, 2) Essays on Particular Works, 3) Shakespeare in the Theatre, and 4) Shakespeare’s Text. While most of this is not new information, I confess I did enjoy the ‘Influences’ section. For some reason I am extremely interested in reading some of the source material for Shakespeare. Was it inspiring, or convenient? We’ll never know. I also happened to be reading the essay “Staging Shakespeare’s Ghosts” at about the same time that I saw a production of Richard III in which the ghost were featured quite prominently, and so this particular essay really stood out for me. I hadn’t really thought about it before, but the supernatural definitely plays a big role in many of Shakespeare’s plays. There were a few essays that dealt with particular performances which held no fascination or interest for me. A live performance is a fleeting thing, meant to be observed in the moment. All the reports, the talk, the writings after the fact won’t make me appreciate what someone once did on the stage. The entire last section, dealing heavily with Wells and his work as an editor, more-so than with Shakespeare’s work, held no appeal at all. There’s a lot of material here in this book, and there’s bound to be something that will appeal to someone who has an interest in Shakespeare, but over-all this just doesn’t stand up to some of the other Shakespeare criticism I’ve read over the years. 28. The First Folio: Where Should We be Without it? Looking for a good book? 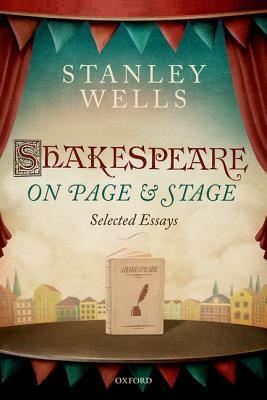 Stanley Wells is a noted Shakespeare scholar and his collection of essays, Shakespeare On Page and Stage, provides some insight into the playwright and his work, but nothing here is too earth-shattering or revelatory but instead is a rehash of knowledge but with Wells’ take on it.